1. Gather your material. You will need beige, red, and white construction paper, sandpaper, white glue and/or hot glue, scissors, paperclips, magnetic tape, a small aluminum pie plate, corn syrup, brown pompoms, a wooden coffee stick, cotton balls, brown Fun Foam, and small double-sided adhesive squares (used for scrapbooking). 2. 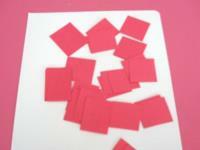 Cut several squares out of the red construction paper. 3. 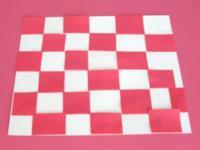 Glue the red squares on the white construction paper to represent a checkered tablecloth. 4. Cut a circle out of the brown Fun Foam and remove the centre to make it look like a donut. Pour a small quantity of corn syrup on the donut and use the wooden coffee stick to spread it. The corn syrup will look like maple syrup. 5. 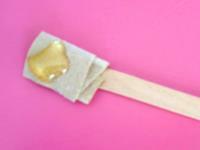 Cut a strip of sandpaper and wrap it around the tip of the wooden coffee stick that was used in the previous step. Add a drop of corn syrup if you wish. Once dry, the corn syrup will have an interesting texture. 6. 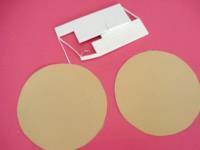 Cut two circles out of the beige construction paper. 7. Press a few adhesive squares on one circle and deposit the other circle on top. This will make the pancake look much thicker! 8. 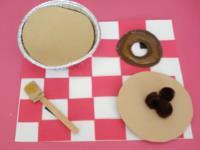 Glue the brown pompoms on the pancake to represent maple syrup. 9. 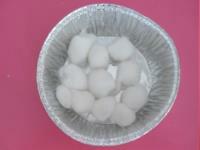 Glue cotton balls in the bottom of the aluminum pie plate. 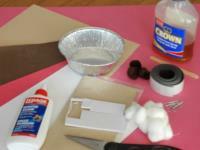 Cut a circle out of the sandpaper and glue it on the cotton balls. 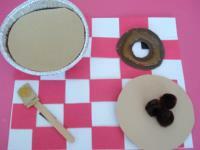 The sandpaper will represent the pie filling for your maple pie. 10. 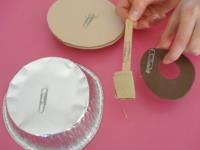 Glue a paperclip under the pancake, donut, taffy-covered stick, and aluminum pie plate. Glue four pieces of magnetic tape on your checkered tablecloth. 11. Children will have fun arranging and rearranging their maple treats on the tablecloth over and over again. Enjoy!